The company says the original name "better reflects editorial focus on hideaway hotels and travel experiences," and it signals to new readers what the brand means. It also carries weight with existing members. The flagship publication of Andrew Harper LLC, Hideaway Report provides editorial reviews and recommendations of hideaways and experiences around the world. The Hideaway Report also improved its website navigation this week, making it easier for users to find information on destinations, hideaway hotels (smaller hotels with a distinctive style and peaceful atmosphere) and experiences. Much of the Hideaway Report’s digital and print content is exclusive to paying members, who drop $395 annually for a print and digital subscription, and $250 for digital-only access. “The changes we are making ensure we remain focused on what members value most — honest, straightforward content uncovering top hideaways and global insights from our well-traveled editors,” CEO Crista Bailey stated. Hideaway Report editors visit hotels and hideaways anonymously and pay for their trips in full. “Being member-funded without advertising support puts us in a special category,” stated Hideaway Report's editor-in-chief, who also remains anonymous. Some 90% of Hideaway Report's revenue comes from subscriptions. The rest is affiliate revenue from partnerships with travel and wine companies. Bailey, who became the CEO of Hideaway Report magazine last September, is working to build a digital-first business model for the 40-year-old, print-centric luxury travel publication. In March, Bailey told Publishers Daily she wants to focus on increasing Hideaway Report's digital subscriptions, limit its free content online, expand partnerships with travel brands to grow its affiliate business and reach out to a younger audience. To date, the number of new print subscribers in 2018 is up 15% compared to last year, and digital subscribers are up 18x, according to a spokesperson. Digital subscriptions make up 50% of all new subscriptions in 2018, versus 5% in 2017. The company claims it is close to doubling the number of new members and subscription revenue in 2018 compared to last year. The brand has about 16,000 print and digital subscribers in total. Roughly 60% of its members have a net worth of at least $2 million, and over 40% are worth over $3 million. Hideaway Report's members combined spend an average of $200 million on travel a year. 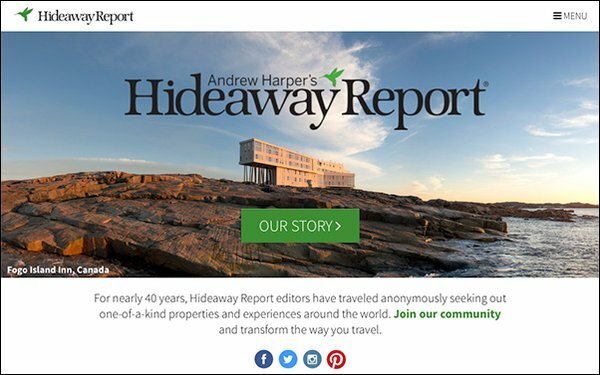 The brand publishes a monthly newsletter called Andrew Harper’s Hideaway Report, featuring two to three destinations its editors traveled to that month, as well as the Andrew Harper Collection, 12 guidebooks updated every year with hotel and restaurant information, recommendations, tips and maps.